This is a mouthful. It doesn’t help that Silver is switching between probabilities (“a 1-in-7000 chance”) and odds (“480,000 to one”). But it’s just a bunch of probability arithmetic. The only part that isn’t simple multiplication is “the odds of at least three such people dying.” In practice your calculator will have some command to solve these sorts of counting problems. The more fundamental insight is that you can multiply the probability of three people dying on the same day in the same city by the number of opportunities where it could happen to work out how often it should happen. The odds “8 to 1 against” is a probability of 1/9, or an 11 percent chance that we’d see three people from the same clinic die on the same day. Is this particularly long odds? This question is hard to answer on its own. The less likely it is that something can occur by chance, the more likely it is that something other than chance is the right explanation. This sensible statement is no less profound when you think it through. This idea emerged in the 1600s when the first modern statisticians asked questions about games of chance. If you flip a coin 10 times and get 10 heads, does that mean the coin is rigged or are you just lucky? The less likely it is to get 10 heads in a row from a fair coin, the more likely the coin is a fake. This principle remains fundamental to the disentangling of cause and chance. Coins and cards are inherently mathematical. Random deaths are a sort of lottery, where you can multiply together the probabilities of the parts. It can be a little harder to see how to calculate the probabilities in more complex cases. The key is to find some way of quantifying the randomness in the problem. One of the earliest and most famous examples of accounting for chance in a sophisticated way concerns a fake signature, millions of dollars, and a vicious feud of the American aristocracy. To work out the probability of these two signatures matching by chance, Peirce first worked out how often a single stroke would match between two authentic signatures. He collected 42 signatures from other documents, all of them thought to be genuine. Then he instructed his son, Charles Sanders Peirce, to superimpose each of the 861 possible pairs of these 42 signatures and count how many of the 30 downward-moving strokes aligned in position and length. Charles found that the same stroke in two different signatures matched only one-fifth of the time. This is the key step of quantifying random variation, which Peirce did by counting the coincidences between signatures produced in the wild. It seemed much more likely that the signature was forged by Hetty Robinson, Sylvia Ann Howland’s niece who was contesting the will. Robinson had access to the original documents and stood to gain millions of dollars by tracing Mrs. Howland’s signature on an extra page spelling out favorable revisions. The probability that you would see data like yours purely by chance is known as the p-value in statistics, and there is a popular theory of statistical testing based on it. First, you need to choose a test that defines whether some data is “like yours.” Peirce said a pair of signatures is “like” the two signatures on the will if all 30 strokes match. Then imagine producing endless random data, like scribbling out countless signature, or monkeys banging on typewriters. Peirce couldn’t get the deceased Howland to write out new pairs of signatures, so he compared all combinations of all existing known genuine signatures. The p-value counts how often this random data passes the test of looking like your data—the data you suspect is not random. There’s a convention of saying that your data is statistically significant if p < 0.05, that is, if there is a 5 percent probability (or less) that you’d see data like yours purely by chance. Scientists have used this 5 percent chance of seeing your data randomly as the minimum reasonable threshold to argue that a particular coincidence is unlikely to be luck, but they much prefer a 1 percent or 0.1 percent threshold for the stronger argument it makes.31 But be warned: No mathematical procedure can turn uncertainty into truth! We can only find different ways of talking about the strength of the evidence. The right threshold to declare something “significant” depends on how you feel about the relative risks of false negatives and false positives for your particular case, but the 5 percent false positive threshold is a standard definition that helps people communicate the results of their analyses. Let’s use this p < 0.05 standard to help us evaluate whether the 1976 flu vaccine was dangerous. By this convention, an 11 percent chance of seeing three people randomly die on the same day is evidence against a problem with the vaccine; you could say the occurrence of these deaths is not statistically significant. That is, because there is a greater than 5 percent chance that we’d see data like ours (three people dying) even if the vaccine is fine, it’s not a good bet to assume that these deaths were caused by a toxic vaccine. But this does not mean there is an 11 percent chance that the vaccine is safe. We haven’t yet said anything at all about the vaccine; so far we’ve only talked about the odds of natural death. Really the question we need to ask is comparative: Is it more likely that the vaccine is harmful, or that the three deaths were just a fluke? And how much more likely? Is there greater or less than an 11 percent chance the vaccine is toxic and no one noticed during earlier testing? 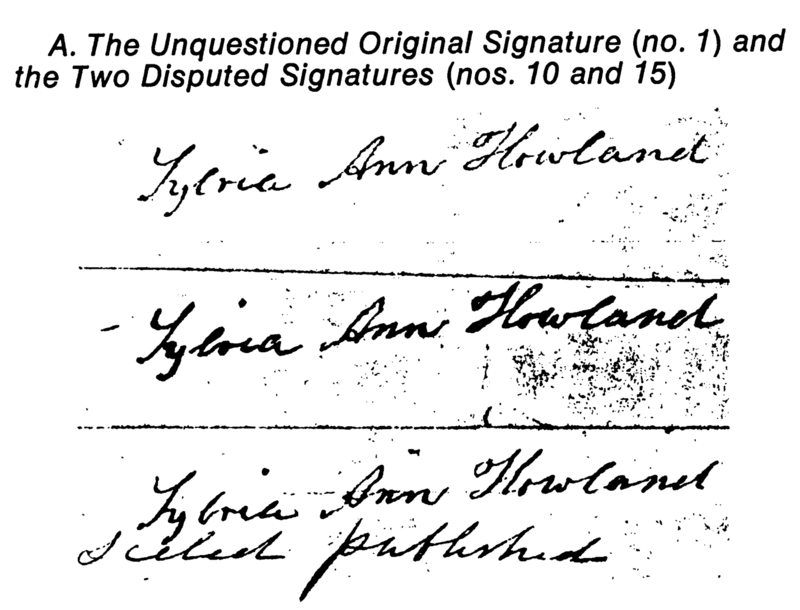 In the case of the Howland will, we found miniscule odds that two signatures could end up identical by accident. But what are the odds that Mrs. Howland’s niece forged the will? A more complete theory of statistics tests multiple alternatives.